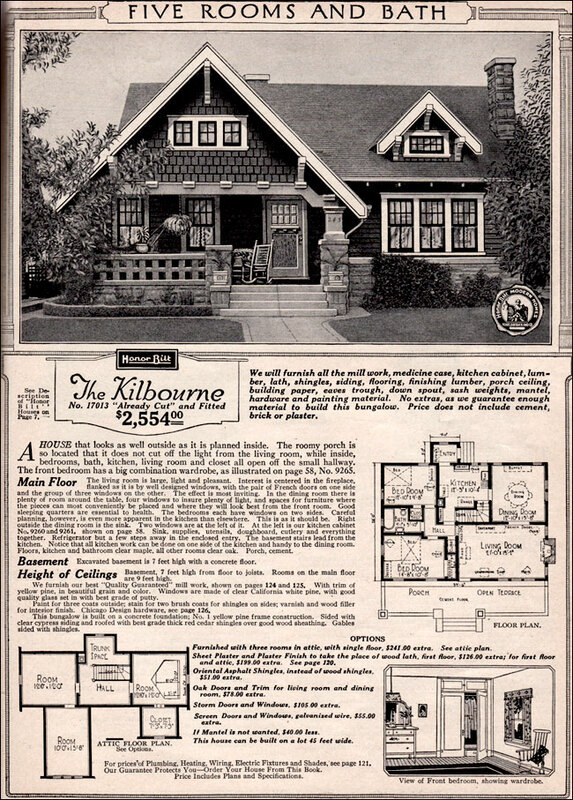 Sears & Roebuck's ultimate DIY kit. There is hardly a one of us who hasn't spent endless hours perusing plan books and magazines, studying in some detail the various floor plan features of the houses depicted; and imagined ourselves living in them. I've done it since I was a kid and still do. I pick them up instead of the tabloids in the supermarket checkout line. Gotta stay on top of what's happening now in the world of architecture don'tcha know? Although I never have, some people go so far as to order plans from these "house catalogues;" and in extreme cases, actually build houses from such plans. 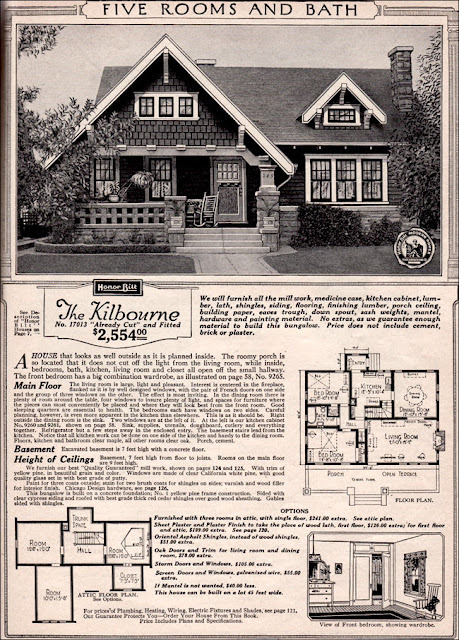 In the early 1900s, Sears and Roebuck not only sold plans, but what could only be termed "house kits" which could be shipped by railroad to your small town or city and erected by local builders, even the owners themselves sometimes. Sears even sold churches in this same manner. one of the earlier and larger Craftsman houses, displays a distinct oriental influence. Despite the fact the style has come to be called the Craftsman style, a name Sears now owns in a slightly different context (home building tools); they didn't start the practice of selling complete houses from a catalogue. That began with a couple designing brothers in Southern California, Charles and Henry Greene, who lived and worked in the Pasadena area. And even though their plan books and the popular architectural and women's magazines of the day spread the style far and wide across America, the best examples are still located in this area. 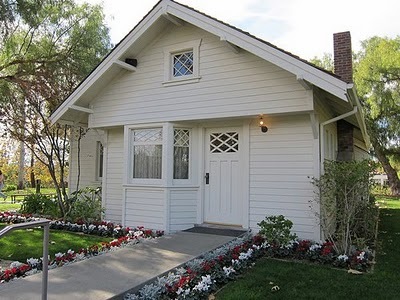 And unlike a lot of other more minor American housing styles in this century and the last, Craftsman homes were seldom huge, grandiose mansions. And though they sometimes outgrew the popular designation used by the Greenes of "bungalows," in most cases they were single-storied structures, or at most contained attic bedrooms making them technically story-and-a-half. 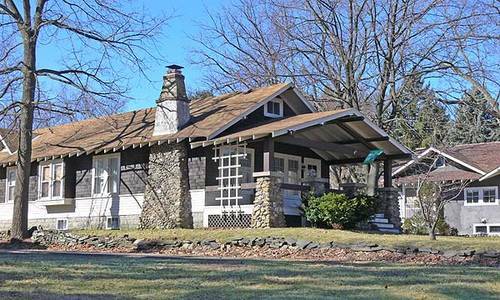 A classic, with virtually all the distinguishing features of the Craftsman style. I think most of us have seen them. The Craftsman's most distinctive feature is their unenclosed eaves supported by actual or fake rafter ends and cross beams. Roofs were low gabled designs, porches were often enclosed under the main roof, and carports were sometimes enclosed under trellises. Most were frame, clapboard structures with brick, stone, even early concrete blocks used for foundations, steps, porches, and columns. Gables often faced the street and some of the earliest examples of modest-size "picture windows" can be found in this design. Only the eave braces contained much in the way of decoration. Foundations and masonry porch details were often sloped (called battered) toward the top. They were easier to build than vertical walls. Quite often, especially in their Southern California birthplace, there is a distinctly oriental quality to Craftsman designs. "...the house my father built." Nixon's childhood home. 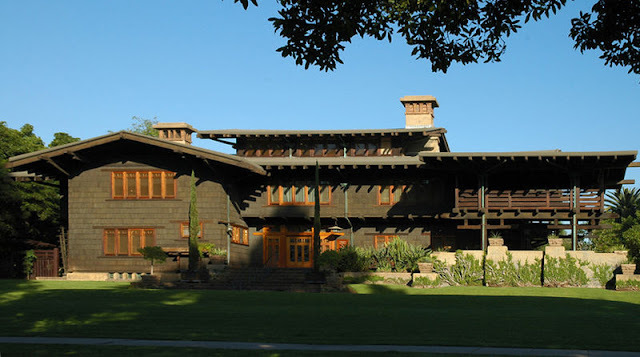 In history, the most famous Craftsman home may have been the one Richard Nixon's father built for his family in Yorba Linda, California. It was a catalogue house. It came by rail, pre-cut, in a kit, with an instruction book, and was put up in less than three months. (Not exactly Mount Vernon.) Although the Greenes started building them as early as 1893, the style didn't become popular until around 1905. The style bears traces of the English Arts and Crafts movement of a couple decades earlier. And, like so many housing styles in the twentieth century, they could almost be termed a fad. By 1920 their popularity was fading. By 1930 few if any were still being built. By and large, those coming from plan books, built from kits, unless lived in by former presidents, were unexceptional, often downright "homely." Made of wood with structural elements often exposed to the weather, unless they were well maintained, many deteriorated quite rapidly. Some of the larger manifestations come off looking so eclectic one has to check out the telltale roof line to determine their ancestry. But the best of them, the moderate ones, those not too big to be called bungalows, nor too small to look cheap, have a quiet, modest dignity and warmth about them. And, despite the fact many of them came in identical kits, in that they were built often by amateurs, injecting their own little architectural quirks, this style is endlessly fascinating to study as they unexpectedly pop up around the corner and up the block of some of our smaller towns and cities. 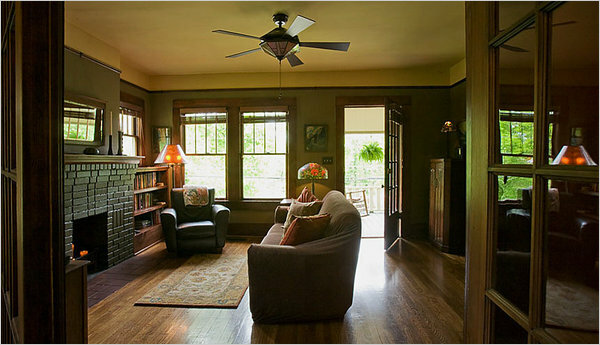 Inside, the best that can be said about the Craftsman houses is that they are "homey."